6 1:08:24 David Long 45 M Beverly MA Wicked-TeamGlostah! 34 1:24:44 Gary Jewett 52 M Beverly MA TeamGlostah! 41 1:27:56 Stephen Whittey 62 M Gloucester MA TeamGlostah! 48 1:30:05 John Wigglesworth 65 M Ipswich MA TeamGlostah! 49 1:30:17 Bob Gillis 64 M Gloucester MA TeamGlostah! 68 1:38:22 Maureen Appleyard 50 F Essex MA TeamGlostah! 74 1:41:52 Tom Mitchell 56 M Beverly MA TeamGlostah! Link below will take you to all stats and full results for the Merrimack River trail race (1992-present). The trail was in very good shape despite 6” of snow that fell exactly one week prior to the race. Heavy rain (2 inches!) during the week removed the snow and the course drained well leaving a mostly mud-less trek. The power-line trail, which isn’t a maintained trail, had a huge number of downed trees but RD Steve Peterson and volunteer Ed Sheldon did an admirable job clearing it out. Word has it that the trail may be unpassable in the future due to construction on the power-line. Time will tell. Race day conditions were typical with temps in the low 40s and a steady wind of at least 10 mph. The wind seemed to be mostly a cross-breeze which felt like a head-wind in BOTH directions! Perhaps the rough weather the week before convinced people the trail would not be in good shape as the smallest field since 2005 showed up (152 finishers this year and 145 in 2005). This was also the oldest average age (43.54) which topped the previous high of 43.0. By comparison the average finisher’s age was 35.3 in 1992 and 36.7 in 1999. Five women’s single age records and one Age Group record (60+) were set and seven men’s single age records and 3 Age group records were broken (under 19, 50, 70). Perhaps the wind slowed things down? For the women only five finished under 1:20 which is the least since 2014 (4). Last year a record 15 broke 1:20. For the men only five broke 1:05 which is the least since 2004. Last year a record 23 ran under 1:05, typically about 10 runners come in under 1:05. Jenn Brooks ran here 11th Rivah and ran her best time (by 3 seconds) getting her first win and the 11th fastest all-time women’s time. She has finished every place in the top 8 except 7th with an 8th, 6th, 5th, 2-4th, 2-3rd, 3-2nd, and her 1st. She also set the age 37 record breaking Pam Alexander’s 1:11:36 from 1992. Lisa Doucett set the 60+ age group record (which is also the 13th fastest 50+ time) taking over 6 minutes off of Marcy Schwam’s 1:38:41 from 2016. She also broke the single-age (61) record by 19 minutes. Carol Comeau, Linda Usher, and Kathleen Furlani ran the 10th, 11th, and 12th all-time fastest 60+ times. Usher also joined the exclusive “100 mile club” with her 10th Rivah finish. Comeau has the women’s lead in “most finishes” with 13. Brandon Newbould picked up his third win which ties him with Dave Dunham, Ben Nephew, and Kevin Tilton. The only other multiple time winner is Paul Low with five. Fred Ross III set a record in the 70+ age group taking over 3 minutes off of George Gilder’s 1:34:11 from 2012. He also took 11 minutes off of Tony Federer’s single age (70) record of 1:41:35 from 2009. Dave Dunham set the 50+ age group record running 28 seconds faster than Matt Curran’s 1:07:15 from 2008. Ed Sheldon ran the all-time 6th fastest 50+ time. Patrick Caron took nearly a minute off of Patrick Moulton’s 61:41 AGR for 19 and under set in 2000. Tim Van Orden (40+) and Stephen Whittey (60+) ran the 4th fastest and 6th fastest all-time times in their respective age groups. Tom Speidel continued his streak. He has finished all (26) of the Merrimack River trail races. Dave Geary finished his 15th consecutive and Scott Spence and Chris Harrison both finished their 12th consecutive. 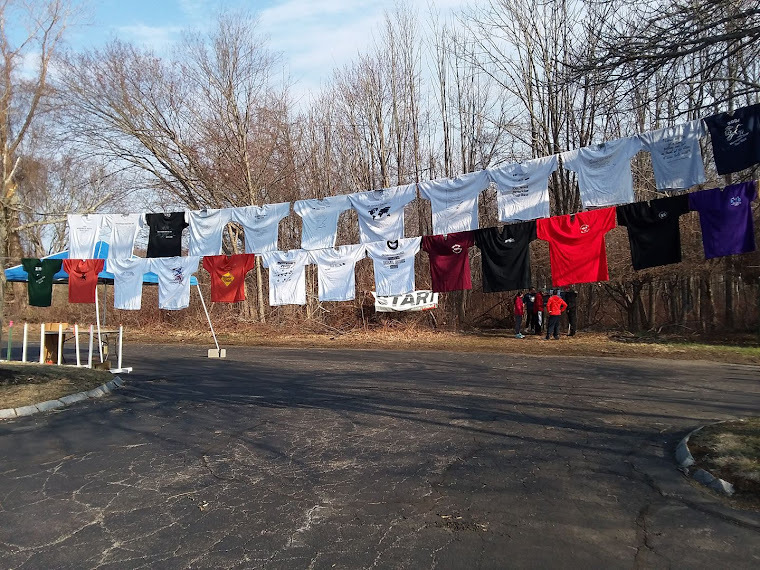 Thirty-four runners have completed 10 or more Rivah’s (100 mile club). Bob Gillis joined the exclusive “200 mile club” with his 20th finish this year. The leaders include Speidel (26), Spence (24) and Paul Comeau (21). Link to nearly 400 finish line pictures! Thank you Rose Washak!